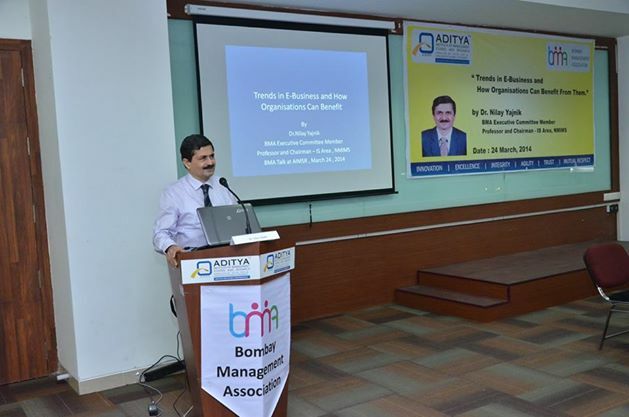 Aditya Institute of Management studies and Research the fastest growing business school of Mumbai along with Bombay Management Association (BMA) organised a seminar on Trends in E-Business and how Organizations can benefit from them, dated March 24, 2014. He spoke about how information technology is benefitting today’s Innovation in the upcoming business scenario. He also discussed about the evolution of the web technology. He gave a detailed note on the various versions of Web technology i.e. Web 1.0 – Static, only information; Web 2.0 – Interactive, Collaborative, Social and Web 3.0 – The Internet of things. He also highlighted the upcoming trends in Innovation like SMAC (Social, Mobile, Analytics & Cloud services), Web based Gamification and Augmented Reality. The seminar was graced by the presence of Mr.V. Sarangapani, Executive Director of BMA and Director, AIMSR ,Dr. Swati Bhandari Lodha.